It’s hard to deny that when it comes to speeding up your workflow in any given software, keyboard shortcuts (AKA Hot Keys) are far and away among the most efficient ways of shaving time off of your digital tasks. Whether you’re gathering some inspiration images in Photoshop, starting some sketches in Sketchbook Pro, Developing a CAD model in SolidWorks or creating a final presentation render in MODO, the use of keyboard shortcuts is critical for optimizing your workflow. However despite the convenience of keyboard shortcuts, the time it takes to actually learn them to the point where they become second-nature isn’t always easy or quick for relatively-new designers and engineers or users who are switching over to new tools. Of course, dedicated keyboards and keyboard ‘skins’ exist specifically for this purpose, however unless you spend 75% of your time dedicated to one of these single programs, it doesn’t seem to make sense to dedicate 100% of your key graphics to that program. Thankfully, if you consider yourself a heavy user of Adobe programs including Photoshop, Illustrator and Indesign, the new Adobe Shortcut Visualizer tool just might be perfect for speeding up your learning time. 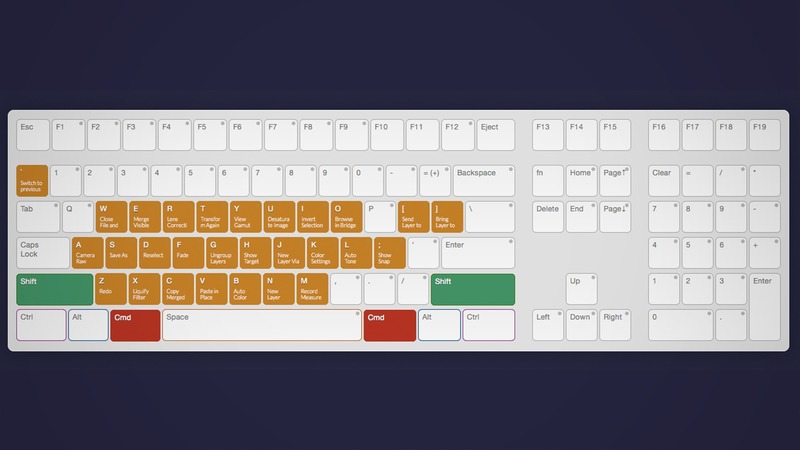 Created by FastPrint.co.uk, the interactive tool displays over 1,00 keyboard shortcuts for Photoshop, Illustrator and InDesign on a virtual keyboard that’s displayed within your web browser. To use the virtual tool, all that a user needs to do is determine which program they want the keyboard shortcuts for, which operating system they are using and if there are any dedicated modifier keys. Once the virtual keyboard matches a user’s real keyboard, the user can both search for individual commands to reveal a specific shortcut as well as mouse over keys on the virtual keyboard to get a magnified view of the key’s function within the dedicated program. As if this wasn’t helpful enough, Fast Print has also supplied users with a variety of free wallpapers that feature the keyboard shortcuts for the programs in a multitude of different resolutions for different screen sizes – meaning, you can easily use the wallpaper on your tablet while it’s propped up next to your physical keyboard. Pretty nifty. Check it out for yourself by heading over to Adobe Keyboard Shortcut Visualiser. Now…if only every digital tool could have an interactive virtual keyboard shortcut tool like this?